To become a Virginia Medical Reserve Corps volunteer you must first register in the Virginia Volunteer Health System (VVHS). VVHS is a web-based information, alerting and credentialing system used by local Medical Reserve Corps Coordinators and health districts for the management of medical and support volunteers who desire to support public health emergencies and daily public health activities in Virginia. How does the Virginia Volunteer Health System (VVHS) work in relation to other volunteer service organizations in my community, such as the American Red Cross or Salvation Army? The VVHS is used by Virginia Medical Reserve Corps units and local health districts. The Virginia Department of Health and your local health district work closely with other emergency response groups, such as the Red Cross, Salvation Army, Community Emergency Response Teams (CERT), Citizen Corps partners and others to coordinate volunteers in an emergency. We are not the same organization, but we all work together to address our communities’ needs. How will the Virginia Volunteer Health System (VVHS) contact me in an emergency? The VVHS requires that you enter your contact information. The information you provide is critical for our ability to contact you about MRC activities and emergencies. After your initial registration, you will be able to re-enter your personal record in VVHS and update it as needed. It is very important to maintain accurate and up to date contact information within the VVHS. Depending on the type of alert notification, you may receive email, text messages or phone calls. You can easily respond with availability using email and phone options. Your local MRC unit, designated personnel and Virginia Department of Health staff will have access to this information. Your personal information will only be provided and used for the purpose of your volunteer role. Help, I don’t remember by username and password! When you go to the VVHS home page you will see the log in box below. Instead of signing in, your click the “Trouble Logging In?” option. You’ll then be given several options to generate passwords to assist you in retrieving your account information. 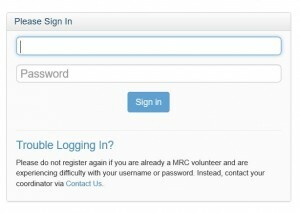 Due to security reasons, your MRC unit coordinator can not provide you with a new password or security answer. They can assist you in verifying your email address and obtaining the account reset emails.